It's been nearly a year since Trump killed the Trans Pacific Partnership by pulling the US out of it; last week, Canadian Prime Minister Justin Trudeau announced that Canada and the other TPP countries would sign the agreement without the USA -- an announcement timed to coincide with Trump's appearance at the World Economic Forum in Davos, presenting the TPP nations as a kind of coalition of the willing for political moderation and maturity. The TPP that Canada and the others signed wasn't quite the TPP that Trump rejected. The new agreement removes the entire Intellectual Property chapter, a nexus of extreme controversy thanks to its implications for the internet, free expression and privacy (the revised agreement is dramatically improved by this, but still has many grave deficits). 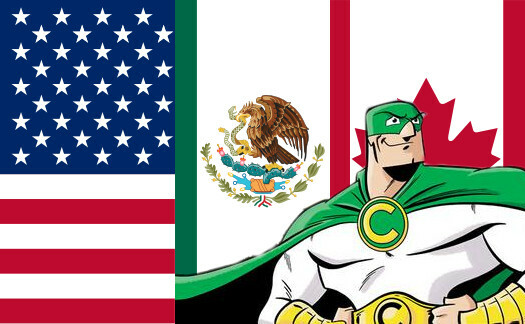 Canada reportedly led the effort to kill the IP Chapter, which US industry lobbied hard for, and now Canadian trade negotiators are about to sit down across the table from heavily lobbied reps from the US Trade Representative to negotiate the next version of NAFTA, the trade agreement between the USA, Canada, and Mexico, which Trump has re-opened. Michael Geist warns that this negotiation would be an excellent opportunity for US entertainment lobbyists to press for the same extreme measures that were just jettisoned from TPP. Doing so would tee up Canada to join the US in demanding similar provisions from the TPP trading partners, in order to "level the playing field" (that is, hang the same millstone around everyone's neck/sign the same suicide pact). The U.S. will seek to bring these provisions back in NAFTA. With the Canadian government having taken note of the public opposition to these rules and the Prime Minister emphasizing the importance of a progressive trade approach that includes a more balanced approach to IP, Canada should not make the same mistake again. It should remain steadfast in supporting the revised TPP IP chapter as the preferred approach, which better reflects international standards and Canadian priorities.